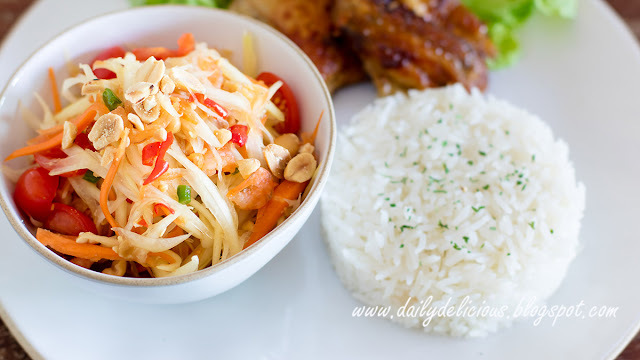 Papaya salad or Som Tum is one of my favorite Thai food (I think that most of Thai people love it, ^^). Actually making it by yourself is very easy, you don't need a lot of equipment! Just mixing the ingredients together in a bowl is fine. 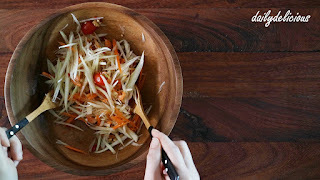 For the unripe papaya, if you can't find it, using carrot instead of the papaya is a good option. Making the salad just before serving is very recommended because the salad will be too wet if it sit for too long. 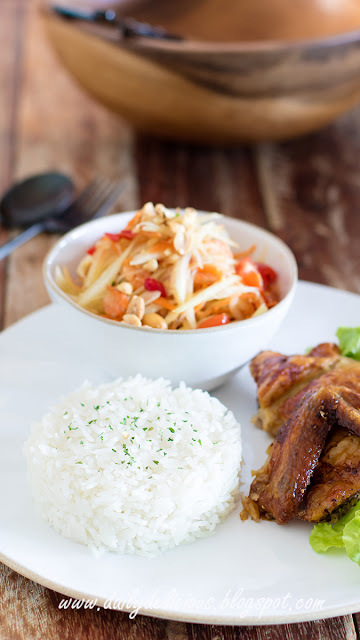 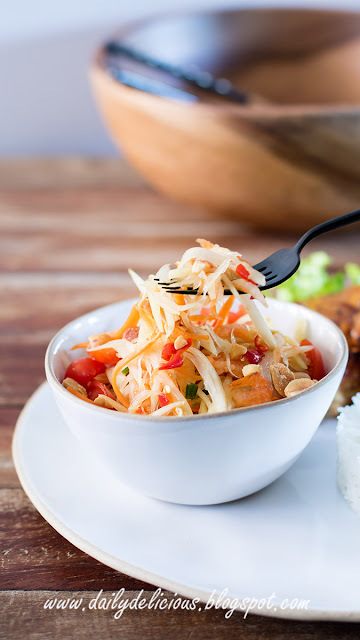 This time, I serve this delicious papaya salad with coconut rice. 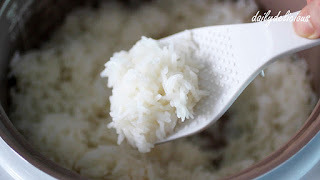 Coconut rice is a rice that cooked with coconut milk, the rice is lightly sweet and rice. 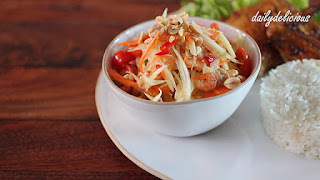 It goes very well with the fresh taste of the salad. 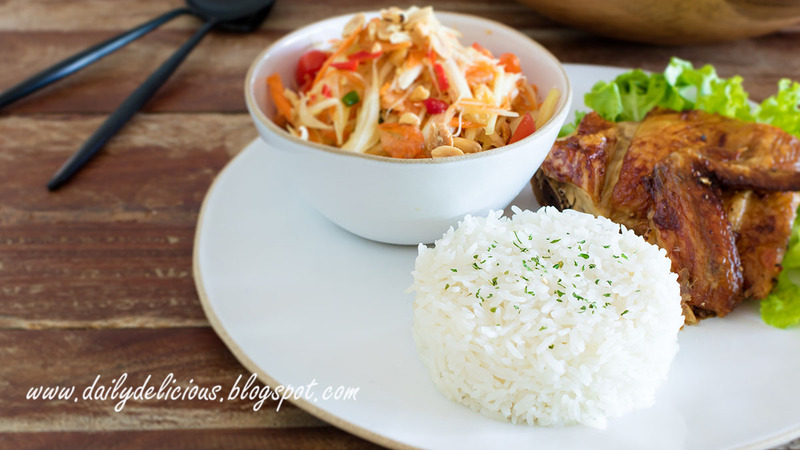 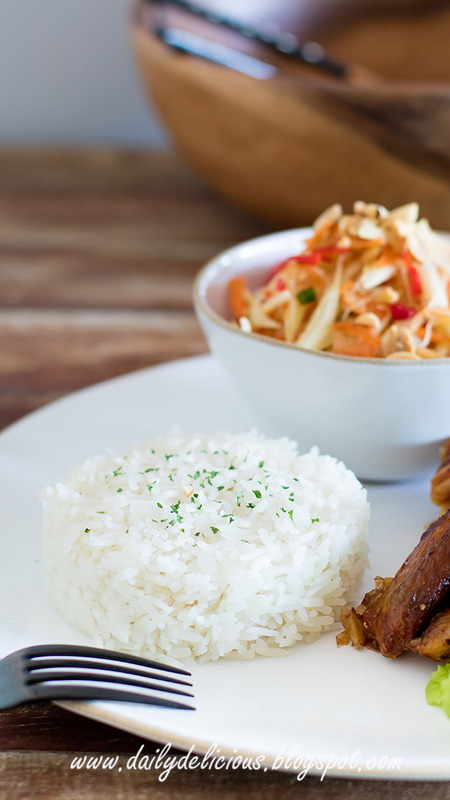 Using Jasmine rice is the best for this dish. *Put them in a bowl of iced cold water with make them crisper, drained before using. 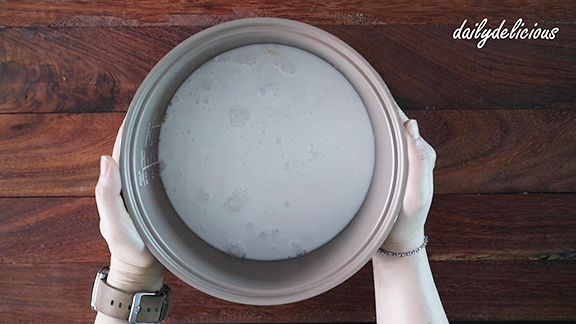 Wash the rice with drinking water, and put in a rice cooker bowl. I use Merito (organic coconut milk) ^^. 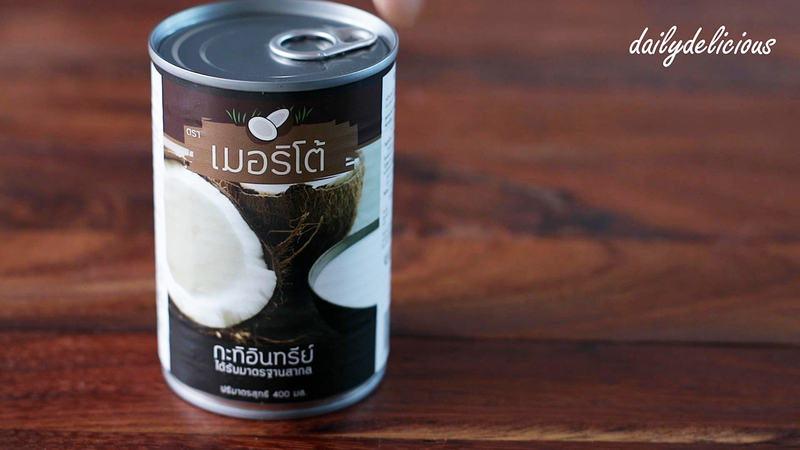 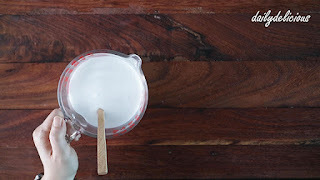 Mix water, coconut milk, sugar and salt together. 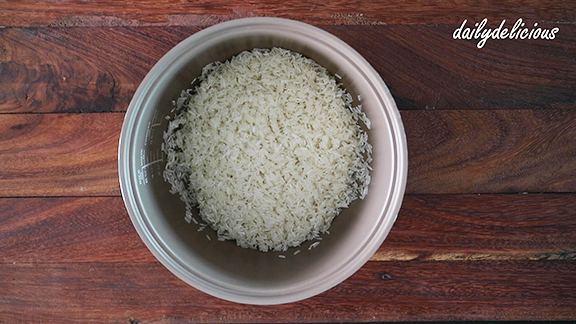 Cook the rice, with standard cooking function. 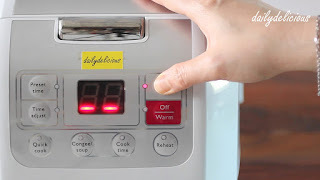 When the rice is ready, remove from the rice cooker. Put the tamarind juice, lime juice, fish sauce and palm sugar into a large bowl, press until the sugar melt. 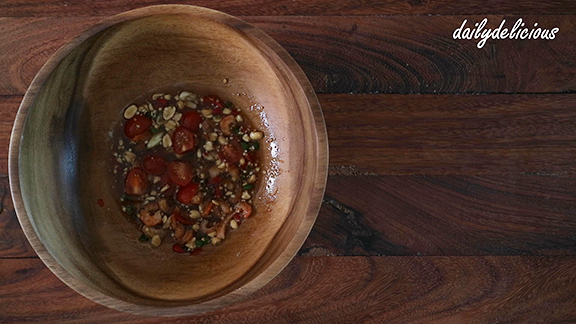 Put the smashed garlic, chillies and 1tbsp of peanut into the bowl. Put the dried shrimp and tomatoes into the bowl. 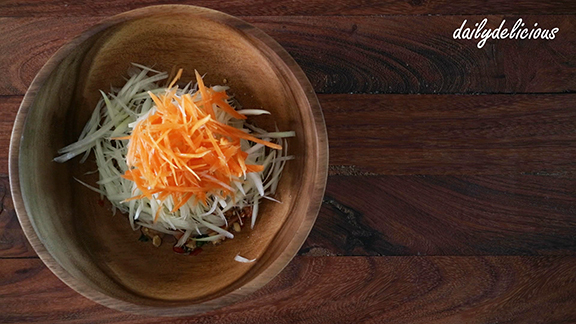 Put both papaya and carrot into the bowl. 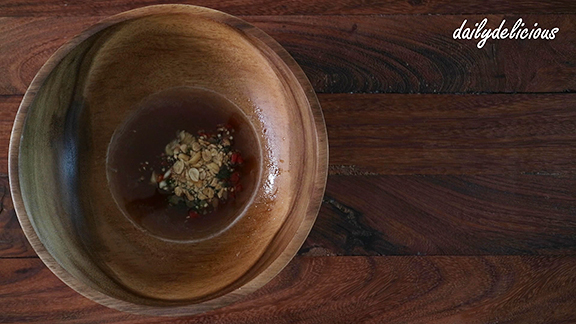 Put in a bowl and sprinkle with the rest of the peanut before serving.